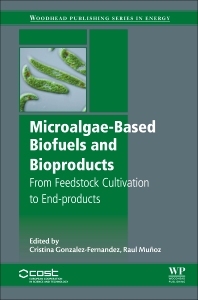 Microalgae-Based Biofuels and Bioproducts: From Feedstock Cultivation to End Products compiles contributions from authors from different areas and backgrounds who explore the cultivation and utilization of microalgae biomass for sustainable fuels and chemicals. With a strong focus in emerging industrial and large scale applications, the book summarizes the new achievements in recent years in this field by critically evaluating developments in the field of algal biotechnology, whilst taking into account sustainability issues and techno-economic parameters. It includes information on microalgae cultivation, harvesting, and conversion processes for the production of liquid and gaseous biofuels, such as biogas, bioethanol, biodiesel and biohydrogen. Microalgae biorefinery and biotechnology applications, including for pharmaceuticals, its use as food and feed, and value added bioproducts are also covered. This book’s comprehensive scope makes it an ideal reference for both early stage and consolidated researchers, engineers and graduate students in the algal field, especially in energy, chemical and environmental engineering, biotechnology, biology and agriculture. Raúl Muñoz completed his Doctoral Thesis “Algal-bacterial photobioreactors for the degradation of toxic organic pollutants” at the Dept. of Biotechnology of Lund University under the supervision of Prof. Bo Mattiasson and Dr. Benoit Guieysse in June 2005. Raúl Muñoz successfully competed in the Spanish National Program “Juan de la Cierva” and joined the Dept. of Chemical Engineering and Environmental Technology at UVa in Nov 2005, with a research focused on biological off-gas treatment of Volatile Organic Compounds. In February 2007, Raúl Muñoz successfully competed in the Spanish National Program “Ramón y Cajal”. In July 2007, the applicant carried out a 3 months research stay at Nanyang Technological University (Singapore). The applicant started 5 years senior researcher contract Ramon y Cajal in January 2008 at UVa, which represented the consolidation in the Dept. of the biological gas treatment and microalgae-based wastewater treatment research lines. In 2009, he carried out a 3 months research stay at UNSW (Australia) at the laboratory of Prof. Richard Stuetz, and a 1 month research stay at Universidad Mayor de San Simon (Bolivia). In 2013 and 2016, Raúl Muñoz also conducted a 6 and 1 months research stay at the Laboratories of Dr. Sergio Revah (UAM-Cuajimalpa, México), and in 2014 a 3 months research stay at Universidad de la Frontera (Chile). Today, Raúl Muñoz is Associate professor at the Dept. of Chemical Engineering and Environmental Technology of Valladolid University. Over the past 10 years, he has collaborated with the leading groups in the fields of gas treatment and microalgae-based wastewater treatment and has been Principal Investigator in over 25 R&D projects. Dr. Muñoz has also published over 134 works published in scientific journals (H index of 34), co-authored 13 chapters in internationally published books, and supervised more than 40 post doctoral researchers, PhD and Master thesis students. Cristina Gonzalez-Fernandez received her PhD degree in Chemical Engineering and Environmental Technology at the University of Valladolid (2008). She carried out her doctoral thesis in the field of livestock wastes treatment for the removal of organic matter by means of mechanical and photosynthetic oxygenation on the liquid matrix and biogas production on the solid matrix. Previously to that, she worked at the Environmental Engineering Department in the University of Cincinnati (USA) where she also obtained a Master on Environmental Science (2005). She got a postdoc position at the Biotechnology Lab in the French National Institute for Agricultural Research (LBE-INRA, France) to work on the optimization of biogas production using microalgae. Nowadays, in the Unit of Biotechnological Processes of IMDEA Energy, her research is focused on advanced processes for biofuel production using microalgae as a substrate. She is co-author of around 50 scientific publications (H index of 21) and reviewer of international journals. Additionally, she has been involved in European and national funded research projects, as well as projects with private companies. Likewise, Dr. Gonzalez has supervised around 20 post doctoral researchers, PhD and Master thesis students.